Dreweatts is holding their next Urban Contemporary sale on Wednesday, April 6. Whilst I continue to struggle to understand why works by artists such as Lucien Freud, Russell Young and Damien Hirst are included in a sale with the aforementioned title, there are certainly a few lots that are both worth taking a look at and actually fit the sale’s theme. These include eight Banksy prints and one of his ﻿Family Target canvases from 2003 (est. 30-50k GBP), a cool Martha Cooper photograph of Shy 147 precariously balanced between two train cars as he paints (est. 1200-1800 GBP), a haunting Guy Denning canvas (est. 3-5k GBP), a Jonathan Yeo Leaf Study (est. 4-6k GBP) and a really beautiful Adam Neate Self Portrait on cardboard (est. 8-12k GBP). The Neate is probably the highlight of the auction, at least in my opinion. It’s my birthday on Friday if a Vandalog reader out there is feeling generous. I’ll take you out for a drink next time you’re in LA to show my gratitude. One of the more interesting aspects of this sale, however, is the final group of works, which will be auctioned in aid of Haven House Children’s Hospice. The twenty-five lots that comprise this section were curated by 15 year old, London-based Liam Patel. I don’t normally reprint press releases, but the text below sums up Liam’s endeavors fairly well so I recommend reading it. Stand-out works include those by Mantis, Herakut (pictured above), Remi/Rough and Matt Small. Liam Patel has been collecting Urban Art since he was 12; now at the ripe old age of 15 he has brought together an extraordinary group of 25 cutting-edge lots to be sold at Dreweatts’ Urban Contemporary sale on Wednesday 6th April, to raise money for the Haven House Children’s Hospice. Unable to do physical charity work for his Duke of Edinburgh Award because he had a broken arm and shoulder, Liam decided to ask some of his favourite artists to donate their work to raise £10,000 for the Children’s Hospice, which offers vital support to children with life-limiting conditions and their parents. Liam then approached Dreweatts to host the sale in their central London branch at 24 Maddox Street W1 and they were only too happy to help by offering the venue, and any extra expertise. ‘I came up with the idea to curate an Urban Art charity auction as the Haven House Children’s Hospice needs to raise around £2m each year to provide fantastic support for children and their families. Even though I won’t be able to raise that amount, every little helps.’ Each piece comes with a certificate of authenticity from the artist and estimates range from £100 to £1,200. 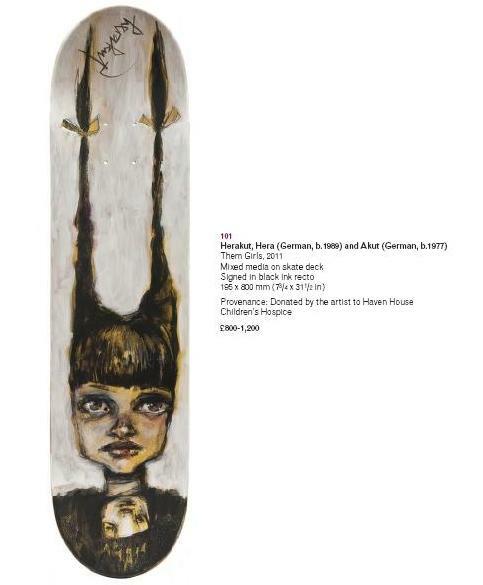 The group to be sold for the charity includes works by the likes of Matt Small, Schoony, Handiedan, Mantis, Nick Gentry, Herakut and Arkiv Vilmansa all of whom were delighted to be able to help by donating the proceeds of their pictures. Image via Dreweatts‘ Urban Contemporary catalogue.